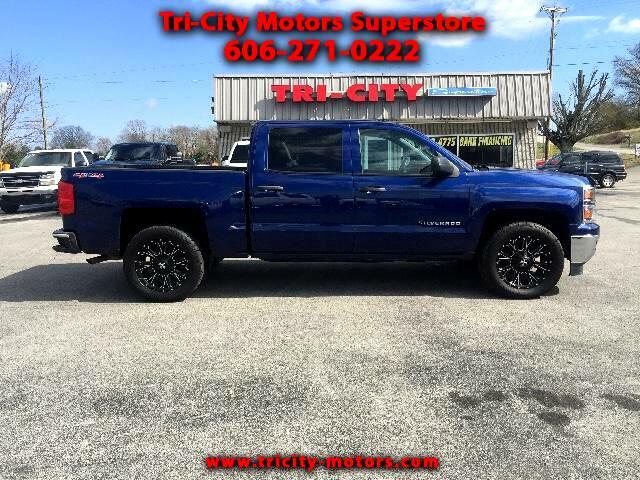 PLEASE ASK FOR JASON WHEN YOU ARRIVE AT DEALERSHIP TO LOOK AT OR TEST DRIVE THIS SUPER NICE 2014 CHEVY SILVERADO 2LT CREW CAB 1500 4WD. IF YOU HAVE ANY QUESTIONS OR WOULD LIKE TO SETUP A TEST DRIVE PLEASE FEEL FREE TO CONTACT ME @ 606-271-0222. THIS 2014 CHEVY SILVERADO 1500 CREW 4WD HAS ALL THE OPTIONS LIKE POWER WINDOWS, LOCKS, TILT, CRUISE, CD, ALLOY WHEELS,AND MORE. IF YOU HAVE ANY QUESTIONS ABOUT THIS VEHICLE OR WOULD LIKE TO SET UP A TEST DRIVE PLEASE CONTACT ME, JASON, AT 606-271-0222, CALL OR TEXT. IF YOU WOULD LIKE TO GET PRE APPROVED FOR THIS VEHICLE, PLEASE CLICK OVER TO OUR WEBSITE WWW.TRICITY-MOTORS.COM AND FILL OUT OUR SECURED CREDIT APPLICATION ONLINE. ONCE AGAIN IF YOU HAVE ANY QUESTIONS ABOUT VEHICLE OR GETTING PRE APPROVED PLEASE CALL OR TEXT ME AT 606-271-0222.